After his last assignment goes horribly wrong, hitman Jay (Neil Maskall) decides to give up his ‘day job’. However, he has bills to pay, a family to support and he is under great pressure to return to his lucrative, if unpleasant, profession. A disastrous dinner party reunites Jay with former colleague, Gal (Michael Smiley), and tempts him to agree to one more job. At first, the task at hand seems simple enough for the killers. However, it soon becomes dark, full of foreboding and fraught with danger. I watched Kill List with a deep sense of unease. I had tried not to spoil my experience of this film by reading too much about it but, nonetheless, I was well aware that it was going to be a pretty unsettling watch. To add to my sense of discomfort, I had to watch this film alone. If you don’t count my Labrador, Ella, that is. So I did what I always do in these situations… I armed myself with a cushion to hide behind, a remote (to switch the film off should it get too intense) and my mobile phone as an extra security blanket. 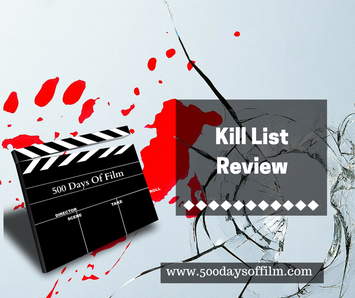 Kill List didn’t actually scare me while I was actually watching it. However, I could hardly bear the tension and I did find the violence tough to watch. Despite this, I was completely gripped and unable to look away from the screen for a second. The direction and all of the central performances are superb. It was only afterwards, when the film had ended that I realised just how uneasy I felt. Suddenly the house felt too quiet and every little noise made me jump. When Ella gave me a little nudge (reminding me about her bedtime treat) I nearly hit the ceiling. I have then spent some time trying to unravel the events that happened in Kill List so that I can sort them out in my mind. I feel it would be good for me to watch this film again with the shocking ending in mind. Kill List is rated 18 by the BBFC because of its strong, bloody violence.